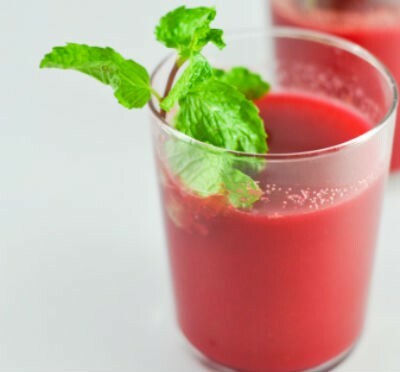 Tasty and healthy drink for the hot summer days. 1. Grind together the beetroot, tomato and carrot. 2. Strain the pulp into a pan. 3. Add salt, pepper powder, cumin powder and lemon juice. 5. Grind the mint leaves and strain well. 6. Add the to the pan. 7. Add the tender coconut and stir well. 8. Keep it in the fridge for 1 hour. 10. Pour into individual serving glasses. 11. Garnish with a mint leaf. Feel free to comment or share your thoughts on this Carrot and Beetroot Delight Recipe from Awesome Cuisine.